Near Page, AZ, off US 89, you'll find a rather inauspicious sign for Horseshoe Bend. I remember not wanting to bother with the hike but Jessica wanted to go. The sign in no way prepares you for the site you'll see. The trail from the parking lot immediately heads up a moderately steep hill. There is absolutely ZERO protection from the elements, so be prepared and wear sunscreen. The hike isn't very long and leads you to the edge of the Colorado River. 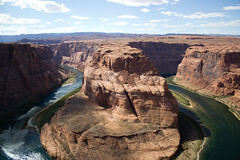 Here you are greeted to an amazing view of the Horseshoe Bend in Glen Canyon. I believe we simply stared (and took pictures) for close to 30 minutes. We probably could have spent an hour or more. It's simply awe inspiring to see. On this trip I brought along my first "real" camera, the Canon T2i and I took the picture you see here. Unfortunately I only had the "kit lens" that came with the camera which limited how wide a shot I could take. So I couldn't fully capture the scene without cutting off parts of the river. Still, I'm very happy with the resulting image. 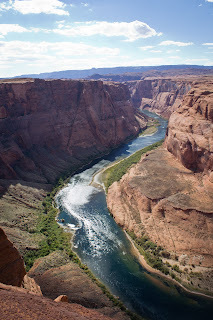 Colorado River journeys through Glen Canyon. So if you find yourself heading to Page, AZ and to the Glen Canyon National Recreation Area, do yourself a favor and pull off at the parking lot for Horseshoe Bend. We definitely want to return one day... with a much wider lens of course! 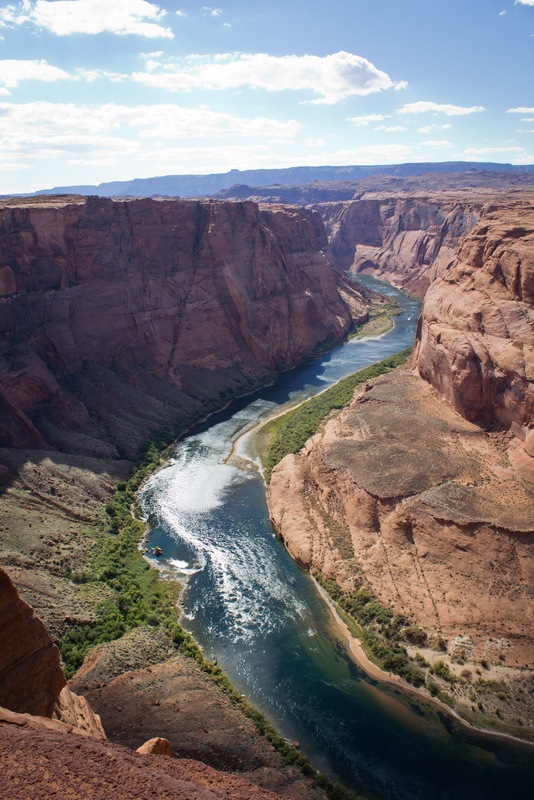 Labels: "Arizona", "Colorado River", "Glen Canyon", "Horseshoe Bend"
See Rock City, or We'll Cut You!